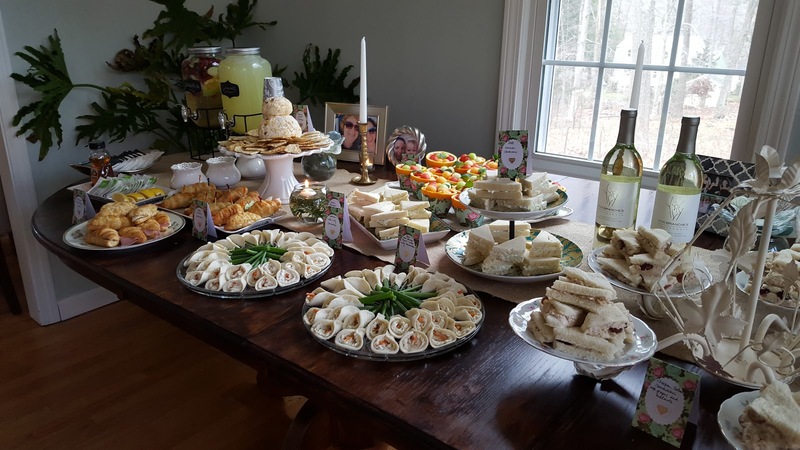 Are you searching for bridal shower menu suggestions? 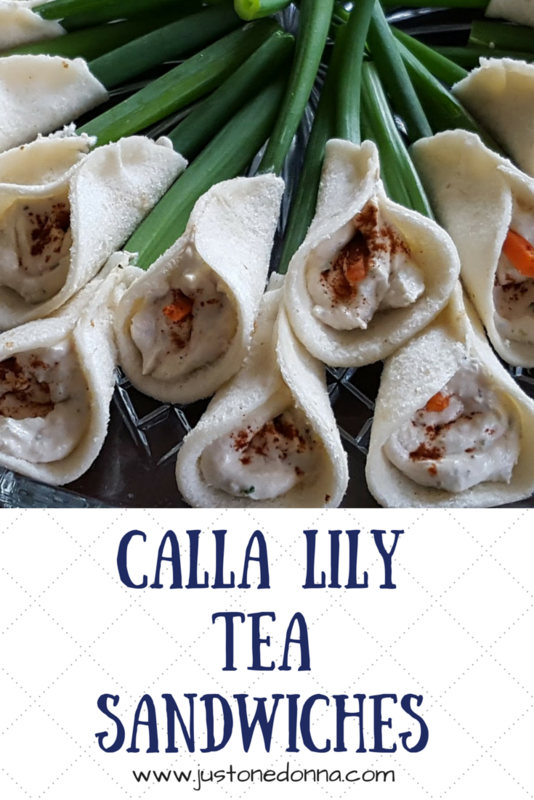 One look at these calla lily tea sandwiches on Pinterest and you might think they are far too fussy for you to make for a bridal shower. That was my first thought when I was asked to make them for a bridal shower recently. They just seemed like too much work for too little impact. I was wrong. 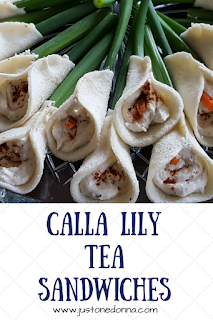 These calla lily tea sandwiches are adorable, tasty and not too fussy once you get your assembly technique down. I must admit these are a perfect little bite to add to your bridal shower menu. They are especially perfect for a bridal shower tea. Make your fillings a day ahead to let the flavors develop. You can also make the sandwiches a day ahead. No bridal showers in your future? These sandwiches would also be fun to serve at your next book club meeting or to your girlfriends who are stopping by for a glass of wine after work. Search calla lily tea sandwiches and you'll find many links and a variety of fillings. I started with these Herbed Cheese calla lily sandwiches found on the Tasty Kitchen site. In my opinion, these sandwiches are best suited to a smooth, well-seasoned filling. I reduced the amount of chopped walnuts and made certain they were very finely ground. You could omit the walnuts entirely. 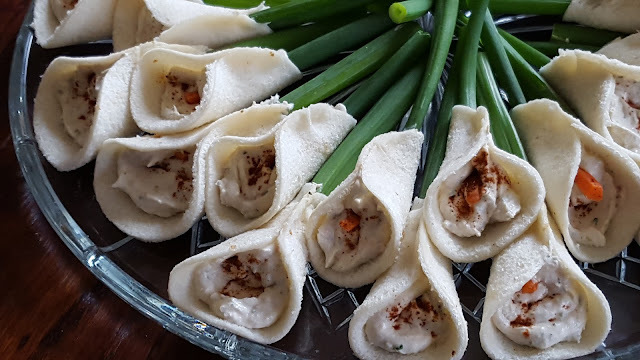 The smoked salmon filling started with a favorite dip recipe I often make. Think about any savory spread you like for ideas about other fillings you may use. I did learn some helpful tips by making these sandwiches that will ensure your success. Don't buy a fancy loaf of bread for this recipe. Any white sandwich bread works perfectly. Taste your filling to be sure it is yummy. All the flavor in the sandwiches comes from the filling. You need to be sure the filling is perfectly seasoned. Use a lightly dampened paper towel to cover the sandwiches as you make them to keep the completed sandwiches from drying out while you assemble the rest. Save time by using pre-cut carrot matchsticks. You'll find them in the produce section of your grocery store. Set up an assembly line. Pre-cut the green onion stalks, cut four to six bread rounds at a time, and complete one step completely before moving on to the next step. The scallions are meant to be eaten as part of the sandwich. If your filling includes onions you may want to omit them. With a 2-1/2" round biscuit cutter, cut 48 bread circles from the loaves of white bread. Using a rolling pin, flatten each bread circle. Place a teaspoon of filling in the center of each circle. Stick a carrot matchstick into the top of a scallion and place it onto the base of the circle. Sprinkle paprika over the filling for garnish. Pinch the sides of the circle together at the base of the circle to form the calla lily flower. Cover the sandwiches with a lightly dampened paper towel to keep them from drying out while you are assembling the sandwiches. Remove the paper towel and cover tightly with plastic wrap. Refrigerate until serving. Place all of the ingredients in the bowl of a food processor. Pulse to process until smooth. Taste and adjust seasoning if necessary. Please use the buttons on the left to share this post. I thank you for sharing! Hi. Jenna. You are so right. These are adorable and they taste good. They are well worth the effort to make them. Such a big hit! What a clever idea. We all enjoy eating pretty food too! So glad you shared at Merry Monday. I'm sharing this post on my FB page today. Thanks for sharing this calla lily sandwich on your FB page, Shirley. These were adorable and tasty sandwiches. Everyone loved them. I hope you'll get the chance to make them. These are so cool and what a beautiful way to display sandwiches! Thanks for linking up to Merry Monday! Sharing on Fb! Have a great week! 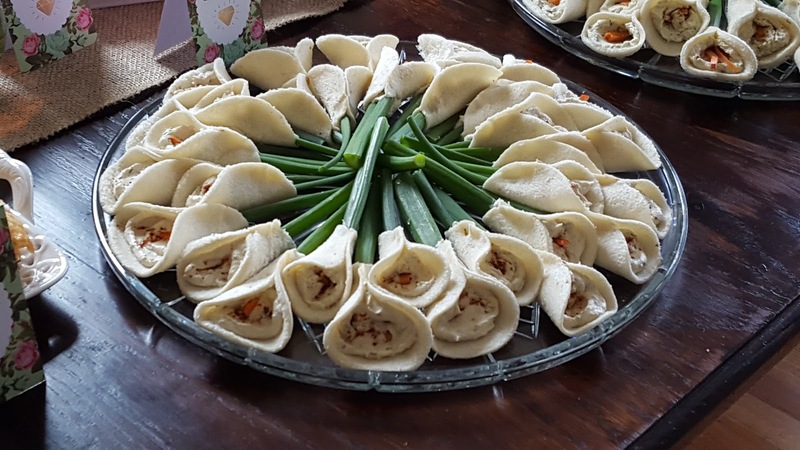 Thank you for sharing these calla lily sandwiches, Kim. I hope your FB tribe likes them, too! Thanks for stopping by.